The Indian army started police action on the state of Hyderabad, code named “Operation Polo” under the command of Major General Jayanthnath Chaudhury on 13th September, 1948. The police action started simultaneously from six directions. Major General J.N. Chaudhury led the army which started from Sholapur. Similarly the Bombay army was led by D.S. Brar, the Madras regiment by A.V. Rudra, the Berar military unit by Brigadier Sivadutt Singh. The Indian Airforce assisted the land army under Air Vice Marshall Mukheijee, The Southern Commandant Lieutenant General Maharaja Singh (GOC) supervised the operation. The Indian army which started from Sholapur seized Naldurg town. From there the army marched forth and occupied Tamalvadi and Aljapur. Simultaneously additional forces rushed to Osmanabad from Ahmi. On the same day the army under Major Rudra marched through Munagala and occupied Bonakallu. Also on the same day the Indian subsidiary army units from Ahmad Nagar, Madhya Bharath and Mysore crossed into Hyderabad borders. The towns Daulatabad and Jalna fell to the Indian army on 14th September. Manikhed and Connegaon in Parbhani district also fell. As the Nizam’s army stationed at Marudu heard the news of the onward march of the Indian army, it scattered for life towards Latur, Aurangabad and Sholapur, but had to surrender to the Indian army on way. In addition to this, the Nizam’s army at Warangal and Khammam also surrendered to the Indian army led by Major General Rudra. Zaheerabad, an important rail road junction also fell to the Indian army on 16th September. On the same day the Indian army reached Hingoli in Parbhani district. As soon as the Nizam’s army ran away from there, the people welcomed the Indian army. The Indian army took control of the Munirabad railway station near Koppal in Raichur district. The Nizam was alarmed as town after town fell to the Indian army and his military units were on the run for life. Laiq Ali was the prime minister of the native state of Hyderabad when police action was initiated against .the state. He resigned to his post and got all the secret documents of the Nizam’s and prime minister’s offices. He wired the Hyderabad agent in Pakistan Mushtaq Ahmed Khan to credit all the office amount to his personal account. He also gave a similar telegram to the Hyderabad agent in London General Meer Nawab Jung to credit 5000 pounds to his personal account. Laiq Ali wanted the amount in both the accounts to be credited to his (Laiq Ali) personal account. Large amounts of money deposited in the State Bank of Latur was moved to a safe place. Meanwhile on 17th September the Razakar leader Qasim Razvi asked the muslims during Friday prayers to slaugh¬ter the Hindus. But the Director General of Police of Hyderabad Nawab Deenyar Jung strongly advised Qasim Razvi again such a move, fearing serious reprisal by the Indian army. Laiq Ali’s cabinet resigned on 17th September, 1948 and handed over the administration to the Nizam. The Nizam’s military commander Major General Ahmqd L. Adrus half mast the Asafjahi flag as a sign of surrender. The Nizam declared the surrender of the native state of Hyderabad through Radio Deccan at 7pm on 17th September. My dear people, I am glad to release this declaration on behalf of his excellency Rajagopala chary, the Governor General of India. My Government has resigned. I am sad as I have not taken this decision earlier. It is too late and I am not able to do anything. I do hereby inform the Governor General of India that I have ordered my army for ceasefire permanently. Not only this, I do hereby allow the Indian troops to rest at the army quarters in Bollaram and Secunderabad. I have created an advisory committee to assist me in day to day administration till I appoint a new prime minister and cabinet. 6. Pannalal Pitti, Sir Mirza Ismail, Nawab ZainYar jung, Diwan Bahadur Aravamudam Ayyangar. Meanwhile, Swami Ramananda Tirtha, pres¬ident of the Hyderabad State Congress was released from prison. The Nizam also consulted the Agent General of India K.M.Munshi about the future of the state. The Nizam government withdrew its application in the security council of the UNO. Meanwhile the Union Home Minister Sardar Vallabhai Patel rejected the Nizam’s advisory com-mittee. Major General Chaudhury reached Hyderabad and took over the reigns of administration. On 18th September, 1948 the Nizam’s army commander General Adrus surrendered before General Chaudhury. As soon as General Chaudhury entered the Bollaram residency, the Nizams representatives Julkadar Jung, Abdul Hasan Sayyad Ali and Ali yawar Jung met him and presented him the list of the members of the advisory committee of the Nizam. But General Chaudhury did not approve of the list. General Chaudhury, after assuming charge as military ruler ordered the house arrest of the former prime minister of Hyderabad Laiq Ali. Qasim Razvi was also arrested. But Laiq Ali escaped to Pakistan in March 1950. He died in 1971 and was buried in Madina. Though General Chaudhury was appointed as military governor, the Nizam functioned as the constitutional head according to law and the natural principles of justice, as the latter had to put the official seal on the decisions taken by the former. General Chaudhury’s military rule came to an end on the 1st of December, 1949. ★ Who was appointed as civil administrator to extend the help to military Governor in the administration ? – P.N. Bakhe, I.C.S. 1. 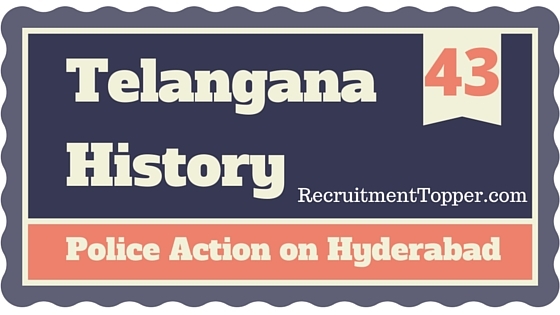 In which year, police action began on Hyderabad State ? 5. Who was the commander in chief of India in Hyderabad state in 1948 ? 6. The day on when the rule of military Governor in Hyderabad State was abol¬ished ? 7. In which year, qasim-Razvi became a pres¬ident of Majlis-Ithehadul Muslimeen ? 10. Last Nizam Mir Osman Ali khan died in the year at ? 11. According to an agreement reached between Nizam Nawab Mir osman Ali khan and Indian Government 25 lakhs has to be allocated for the maintenance to Nizam palaces and building on which that agreement has reached ? 12. During the operation Polo (September 1948), who was the Prime Minister of Hyderabad State ? 13. At the time of merger of Hyderabad State into Indian Union (1948), who served as Indian Agent General ? 15. At the time of merger of Hyderabad state 1948, who is working as defence minister in Indian Government ? 16. In Hyderabad state, how many districts belongs to karnataka area ? 17. How many years, Asaf Jahi dynasty ruled Hyderabad state ? 18. What is the serial number of Mir Osman Ali khan among the Nizams of Hyderabad? 21. Who run the paper ‘Imroj’ in Hyderabad state? 22. The day on which Nizam Kingdom, reached an agreement called status 240 city with Indian Government ? 23. On which day Nizam government sent a group about hyderabad to complaint in the united nations ? 24. M.K. Vellody, who appointed as civil administrator for Hyderabad State, was on I.C.S after of which state ? 26. After general elections held in March 1952, Who became a chief Minister of Hyderabad State ? good information with detailed explanation and the best part is bit bank. it is a lot to the aspirants.thanks a ton for your work.